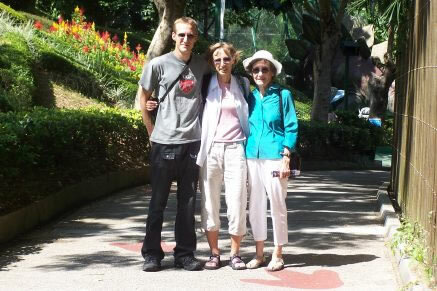 We have 3 generations of visitors come from NY - Ann's mom Cathy, brother Richard, and son Mike. Richard and Mike have been here before so they are old hands at navigating the city. 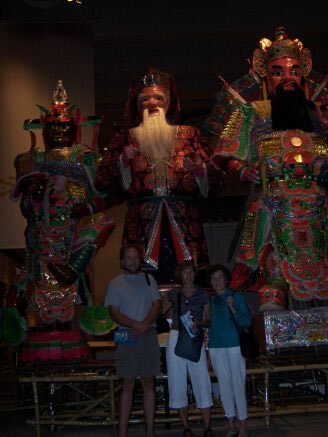 It's mom's first trip to Asia and a new experience. We check out museums, do a full day at Ocean Park Aquarium, walk the loop around Victoria Peak, have dinner at Lamma island, experience Wan Chai Market, visit Stanley for shopping, explore Hong Kong Park, attend a Methodist church. Richard and Mike have their own quarters at another tower in the complex and they accompany us on our adventures as well as have time to check out a bit of the nightlife of the city. Richard and Mike have to leave after about 10 days - work is calling, but Mom gets to stay for another week and a half. 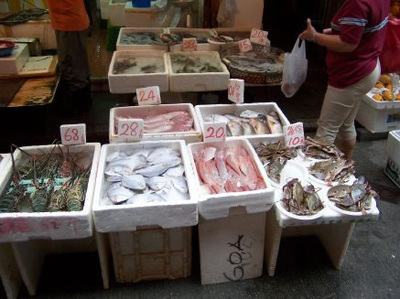 She becomes comfortable with walking the promenade, visiting the local grocery store, enjoyed the bakery, and locating the morning newspaper. She still remains the 'Scrabble' queen of the family. 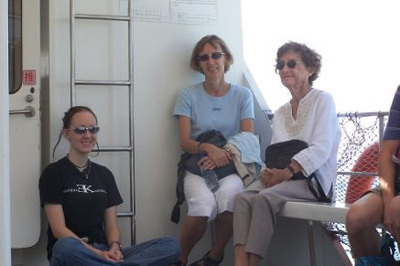 Sharon, Ann, Mom on the ferry to Lamma Island. 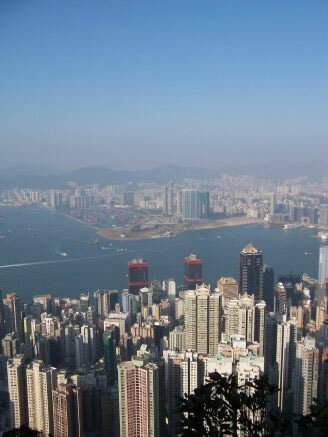 View of HK from Victoria Peak. 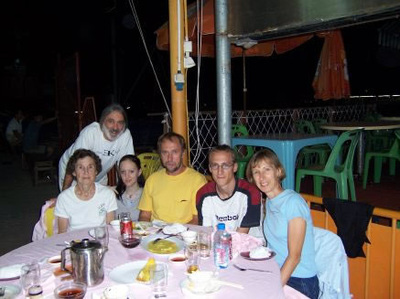 Lamma Island dinner - Mom, Billy, Sharon, Richard, Mike, Ann. Mike, Ann and Mom at Ocean Park Aquarium. 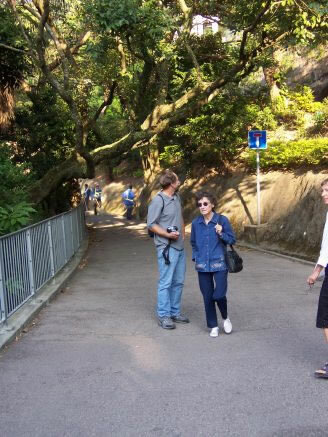 Richard, Cathy walking the loop around Victoria Peak. 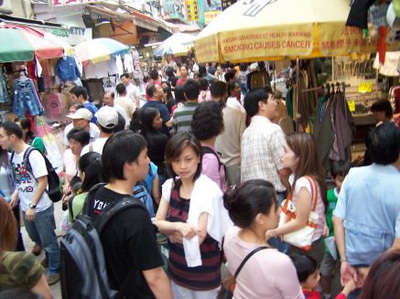 Crowded market in Hong Kong. 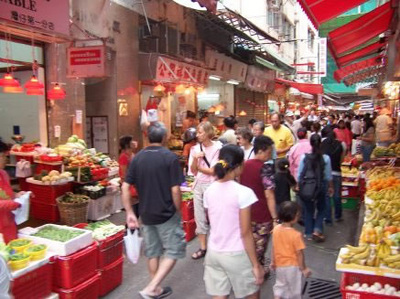 Colorful Wan Chai Market - fruit, vegetables, clothes, fish, meat, a bit of anything and everything - noise, people.